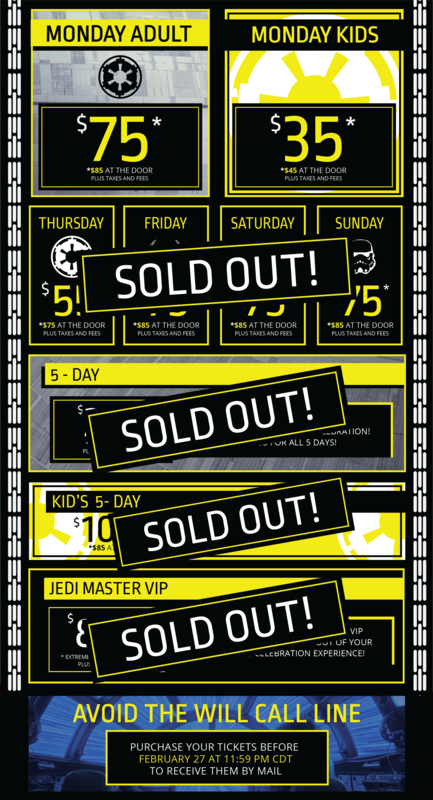 All attendees six-years-old and up need a ticket for Star Wars Celebration. Kids 6-12 must purchase either a Kids 1-Day or a Kids 5-Day ticket to attend the show. For those 13 and over, purchase of an adult ticket is required. Please be prepared to show proof of age onsite. Please note: all minors under the age of 16 must be accompanied by a parent and/or guardian. The entitlements that come with a Jedi Master VIP ticket are only provided to the person holding the Jedi Master VIP ticket. Children under 6 years of age may accompany a parent with a Jedi Master VIP ticket but are required to sit on the parents lap for any panels at the Celebration Stage with reserved VIP seating. Any additional family members 6 years of age and older that want to accompany a Jedi Master VIP ticket holder and enjoy the entitlements that are provided must also purchase a Jedi Master VIP ticket. If you are purchasing your tickets on or before the ticket mailing deadline on February 27, 2019 your tickets will be mailed via USPS to the address you enter. International orders will have the option to have tickets mailed or picked up at Will Call. If you order 5 or more tickets, please note that UPS shipping will be automatically added to your order to ensure delivery. If you purchase your ticket after the ticket mailing deadline, you will have to wait in line at Will Call to pick up your tickets. After March 1, we will not be able to make edits to your mailing address. International orders will have the option to have tickets mailed or picked up at Will Call. There is a limit of 12 tickets per transaction. You are able to purchase up to (4) Jedi Master VIP Tickets and (8) tickets of any other type. © 2019 ShowClix on behalf of Star Wars Celebration. All sales are final. Tickets are non-refundable.